Although he is not new to art, he is a new member of the Mesopotamian Night Family. Ninos Chammo (www.ninoschammo.com) is a scultptor, painter and jewelry maker – a worldwide renowned artist. It is with great pleasure to announce that Mr. Chammo has donated one of his art pieces to Mesopotamian Night 2014. 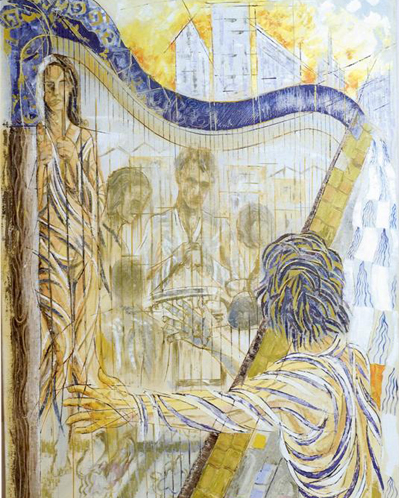 In the oil on canvas piece entitled “Nostaligia”, Mr. Chammo captures the spirit of Mesopotamian Night by displaying visions of dancers, musicians and audience enjoying the scene. “How do I describe my art? As a fusion of cultures. From Gelgamesh's immorality, to Dante's inferno, to Gibran's philosophy, my work bridges historical and cultural difference. I am eternally inspired by the earth's natural elements of fire and water, earth and sky, and life and death. I was chosen by Art. It's not what I do - It's who I am. schools, ateliers and artisan shops. At the Accademia Delle Belle Arti, I gained a profound understanding of the fine arts. I became proficient in creating frescos and monuments at Raymondo Riaci Atelier. I discovered one of my greatest passions - Sculpting - at Bronzi Di Firerce. There I worked as a professional sculptor, creating statues in Bronze A Cera Persa- I also worked in Bini Alfonso, the famous artisan shop, alongside the Japanese artist, Harwo Kinoshita. Under Florentine traditions, I created wood sculptures and paper mache masks, as wells as interior design and jewelry for Ponte Vecchio. For the last three years, I have been designing sterling silver jewelry in New York City. My work has been displayed in galleries throughout Europe and United States. It is our pleasure to announce that Mr. Fred Parhad, the renowned Assyrian sculptor, will be honored at the 7th annual Mesopotamian Night. The event will be held in San Jose on June 21, 2014, at the California Theatre. At the event, Mr. Parhad will receive the honor of “Raab Amneh” (Master of Arts). In addition, Mr. Parhad will be offering one of his works to be auctioned off at the live auction where the proceeds will go directly to support the efforts of the Assyrian Aid Society of America. There will also be a showcase of Mr. Parhad's works in the lobby that evening. We look forward to seeing you there . 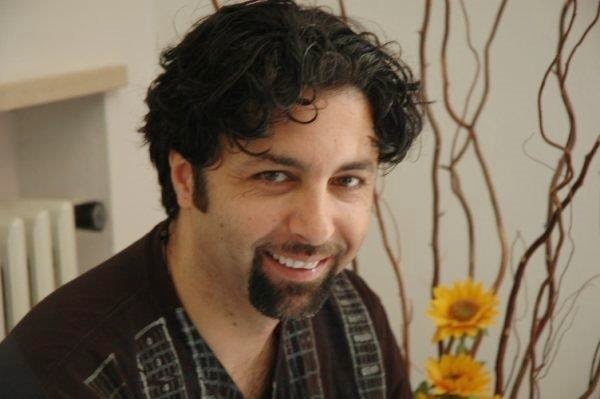 . .
Below is a biography of Mr. Parhad. 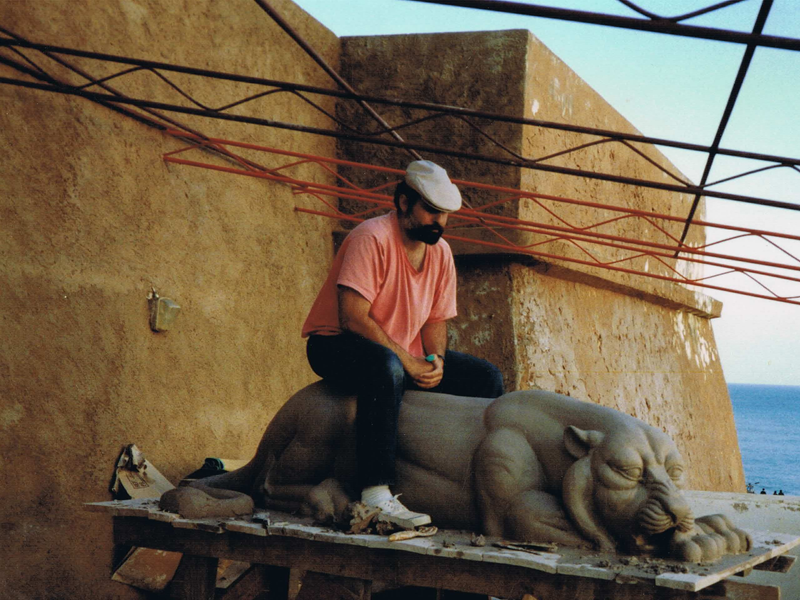 Fred Parhad is a self-taught sculptor with over 35 years of professional dedication to his work. From the start he chose to approach the art world in the only way he believed could produce satisfactory results; he challenged himself to learn by doing. In 1976 he moved to New York and for the next four years worked in foundries to learn the techniques and traditions of a craft well over five thousand years old. Eager to study from the best instructors history had to offer he spent the hours away from the foundry at the Metropolitan Museum of Art where, on an initial visit to see his beloved French Impressionists, he walked through the Near Eastern Galleries and saw, for the first time, the collection of magnificent Assyrian and Babylonian art. The Impressionists would have to wait. He received permission from the administration to copy, in clay, the “Lion of Ishtar” , which was to be the first of over thirty Assyrian/Babylonian art pieces he would copy, which served as his teachers. 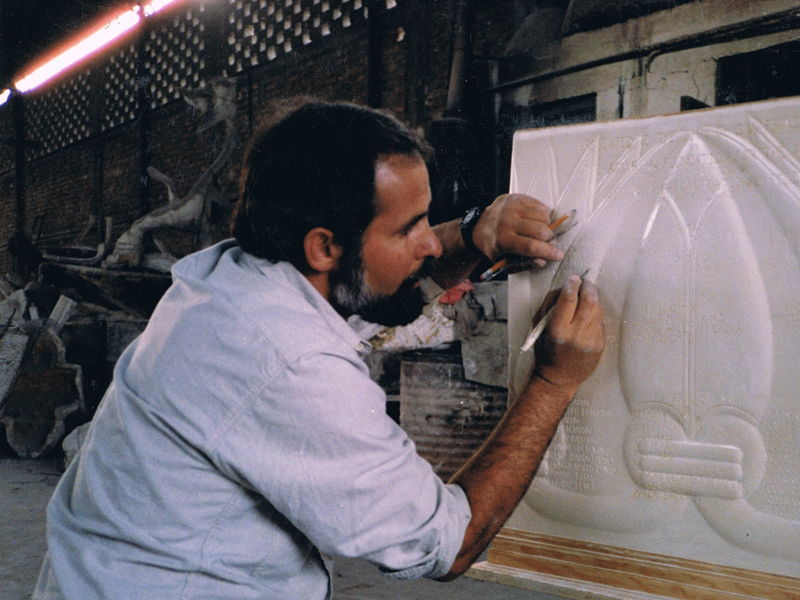 Beginning in 1978, and on his mother Bella Parhad's advice, he presented his bronze and glazed ceramic sculptures at annual Assyrian conventions around the country. 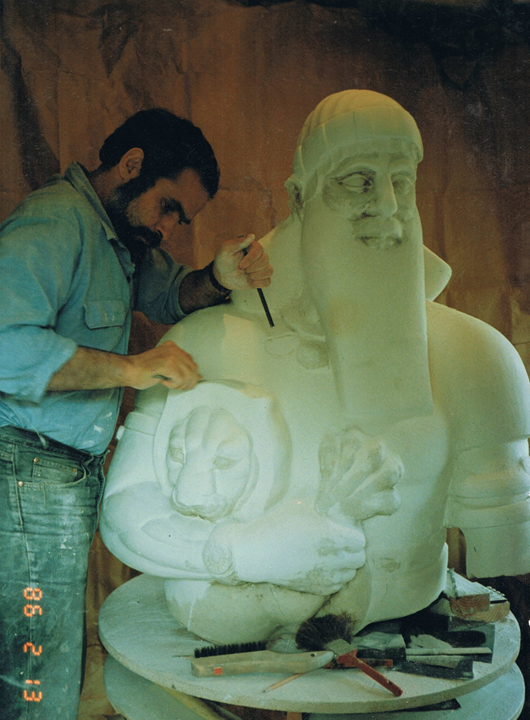 In 1983 Fred began work on a bronze monument of Ashurbanipal, installed in San Francisco's Civic Center, in 1988. This is the first Assyrian public monument placed anywhere in the world in the last 2500 years. A final site is being considered for his monument of Shumirum. In addition to Assyrian sculpture Fred has had a bronze portrait of Mark Twain installed at the Bancroft Library, at the University of California, Berkeley, which is the primary repository of the Twain papers. They are also publishers of the final and complete Twain Biography. Also this year he will complete eleven bronze portraits of the pioneers of the food and wine revolution in America of the 1970s, which includes Narsai M. David, Julia Child, Robert Mondavi and others. The collection will be installed at the entrance to Napa Valley College's Culinary Arts campus at St Helena, California. 8 April 2014 – San Francisco, CA: The Assyrian Aid Society of America present the Seventh Annual Mesopotamian Night (www.mesopotamiannight.org) event at Saturday, June 21 at the California Theatre in San Jose, California. In the Mesopotamian Night gala tradition, the evening begins at 5pm with a reception featuring fine wine and hors d’oeuvres followed by Assyrian-themed performances starting at 7pm. Throughout the evening, a silent and live auction will offer an impressive gallery of art works by Assyrian artists. Considered the premiere fundraising event of the Assyrian Aid Society of America, this event has also become the primary medium for advancing and promoting Assyrian arts and culture including music, sculpture, painting and dance. This year’s performance program is comprised of two acts. Act One is a ballet theatre presentation of The Little Lantern based on the popular children's book written by Ghassan Kanafani. The libretto and exquisite choreography is created by Assyrian ballerina Sherene Melania with enchanting musical composition and arrangement by Assyrian composer George Somi. Melania, a member of the San Francisco Arts Commission, is also the Artistic Director of the internationally-acclaimed Presidio Dance Theatre. Act Two features music from the repertoire of Assyrian composer Alexander Shoora Michaelian performed by the Mesopotamia choir and symphony orchestra conducted by Maestro John Kendall Bailey, followed by the music of Assyrian singer Ogin Betsamo. Tickets for this year’s event can be purchased directly at the theatre box office or Mesopotamian Night or online at: http://www.mesopotamian-night.org/p/tickets.html. Tickets may also be purchased directly, without a service fee, by contacting Sabrina Abraham at (408) 921-2401 or sabrinaabraham@mac.com.